The prior posts in this series have alerted us to the dual meanings of “gospel” in antiquity, and also to the argument—apparently broached here for the first time—that Tertullian (the primary ancient witness to Marcion’s “gospel”) never had a text of the arch-heretic in mind at all. In support of this view one can point to the astonishing fact that in all of Tertullian’s five books Against Marcion (AM), one nowhere encounters a clear citation from a text that we could call the “Gospel of Marcion” (see below). This is damning, for it is impossible that the Church Father would critique a text while never offering a quotation from that text! Who critiques a text without repeatedly citing it? After all, such a citation would be very easy to pen: “Marcion writes [such-and-such]…” With the arguable exception of the Antitheses, however (see AM IV.1), Tertullian never communicates that Marcion has written anything. We do not encounter the locution “According to what Marcion writes…” or equivalent language. Instead (over and over!) we encounter statements such as: “The heretic of Pontus introduces two Gods…” (I.2), “how arrogantly do the Marcionites build up their stupid system” (I.8), and so on. Now, “introducing” and “building up” are Tertullian’s opinion. They do not allow us to conclude that Marcion wrote anything. Even less do they allow us to speculate on the wording of such alleged writing by the arch-heretic. We see from myriad such citations in his Against Marcion that Tertullian is critiquing something far more fundamental and dangerous than a single text. He is in a death combat against nothing less than a subtle and profound “system.” The Church Father is fighting against an entire theology! This helps explain his five massive volumes. It is wrong to suppose (as does modern scholarship) that the Church Father expends so much ink parsing and correcting a single text that he never even quotes. From reading the several Church Fathers’ attacks on Marcion’s theology (particularly those of Tertullian) it is clear that the arch-heretic’s christology belonged to Stage 2 above. For Marcion, “Jesus” was a spirit that indwells the saint. Like Paul, then, Marcion was a docetist: the saving aspect of the Godhead is not fleshly, but spiritual. Marcion, however, seems to have gone one step further than Paul—he proposed two Gods: one (superior) of the spirit, the other (inferior) of the material creation. The figure ‘Jesus of Nazareth,’ as we have seen, belongs to Stage 3. That figure is late—clearly a second century development. Thus, we see that Marcion’s incisive theology predated that of the Great Church. 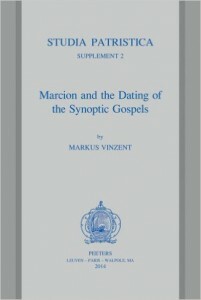 In this sense, Marcion’s “gospel” indeed predated the canonical gospels (as Vinzent and Klinghardt maintain). The problem, however, is that Marcion’s “gospel” was never the text that modern scholarship has, for over a hundred years, attempted to reconstruct word-for-word and verse-by-verse. We can now appreciate the massive challenge facing Tertullian. The incipient Roman Church—with its new figure Jesus of Nazareth—had to combat a deep theology that was already on the ground in many places and was well developed. So it is that Tertullian uses the most potent weapons at his disposal: the recently written canonical Gospels with their fabulous new hero and savior, Jesus of Nazareth. Tertullian uses those texts (not only the Gospel of Luke) against Marcion’s whole theology. 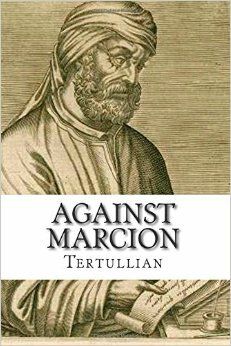 In order to combat the priority of Marcion, Tertullian attempts to reverse the order of history. He accuses Marcion of having theologically (not textually!) “mutilated” the Gospel of Luke—thus making Marcion second. At the same time, the Church Father claims that all four canonical gospels came down from the twelve apostles themselves (AM IV.5)—thus, attempting to establish an unbroken chain of authority back to “Jesus of Nazareth” himself. Of course, we know that those apostles were themselves creations of the canonical gospels (as also was Jesus of Nazareth). This is just another circular argument—so typical of Tertullian. Here Tertullian is explicit: the “gospel” that he refutes is “the very one” that Marcion “argues in his Antitheses.” Nothing could be clearer. The Church Father combats the theology found there, particularly the theology of two gods and the theology of the docetic Jesus. He writes: “The principal, and indeed the whole, contention [of Marcion] lies in the point of number: whether two Gods may be admitted…” (AM I.3); “In the first place, how arrogantly do the Marcionites build up their stupid system, bringing forward a new god…” (AM I.8); etc. Many additional citations could be mustered to show that Tertullian is combating a theology, one summarized in the Antitheses (whether written or not) of Marcion. To understand the concept of docetism it is first necessary to understand what was meant by “Jesus.” In the first christological stage noted above, “Jesus” was not identified with materiality, nor with the flesh, nor with any person—“Jesus” was the saving gnosis. In Stage 2 the saving gnosis indwelled one or more human beings. In this stage, however, “Jesus” was emphatically not the same as the fleshly human vessel(s). “Jesus” was, rather, the saving spiritual entity. According to this christology, flesh/materiality was of no account. When we understand this concept, we can see how pointing at a person and saying “There is [the] Jesus” is not directing the attention to a human being at all, but to the divine element inside that person. There exists a misconception today, one fostered by the malicious Church Fathers of ancient times. 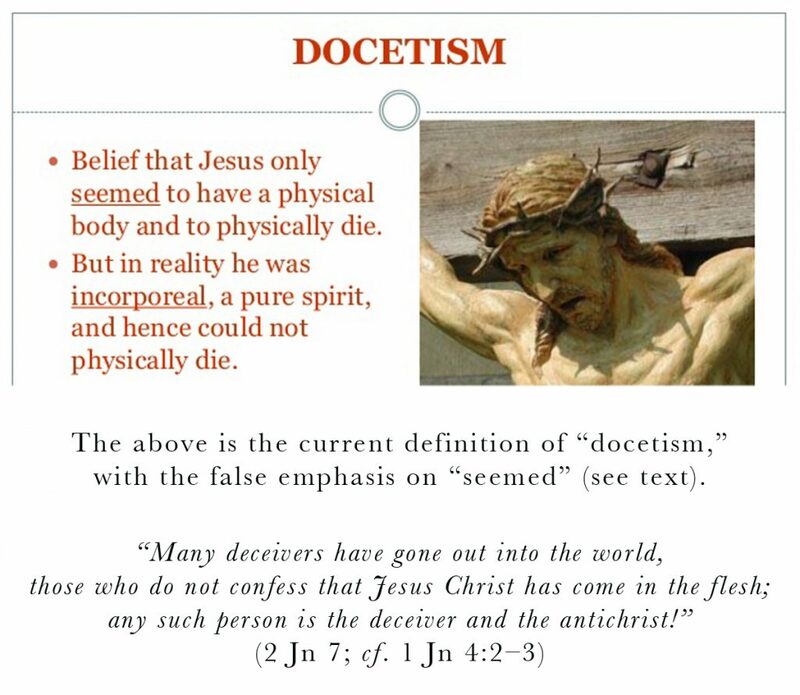 It lies at the very root of the word “docetism” (from Gk. dokein, “to seem”). The docetists never thought that Jesus “seemed” to have a body. For the believers in the christological Stage 2, the divine spiritual Jesus was entirely separate from the flesh which, as we have noted, was of no account. Jesus was not a phantom. He was not a spirit walking about without a body. “It” was a spirit using a body to walk about, but separate from that body. We today might call this ‘spirit possession’—but with divine, rather than demonic overtones. This was Marcion’s christology, Paul’s christology and, it would appear, the christology that dominated in the first century CE. With the foregoing in mind we can understand some of Tertullian’s accusations against Marcion. The Church Father writes that “In the fifteenth year of the reign of Tiberius (for such is Marcion’s proposition) [Jesus] ‘came down to the Galilean city of Capernaum'” (AM IV.7). If Tertullian was accurate here regarding Marcion’s views, this means that the heretic held that the divine spirit ( = Jesus) came down from heaven and indwelled a human being, one who lived during the reign of Tiberius and in the town of Capernaum (the hometown of Jesus according to the Gospel of Mark). I have some doubt that the reference to Capernaum and the “reign of Tiberius” actually go back to Marcion—I suspect that Tertullian is imputing elements of the orthodox Jesus story to the heretic. Be that as it may—and putting aside all notions from the later canonical gospels (admittedly difficult for most of us to do)—there is nothing in Marcion’s belief here that limits Jesus to one person, or that identifies “Jesus” with the flesh of any man. We will see in the next and final post in this series on the “Gospel of Marcion” that Tertullian was engaged not in combating a text, but in a major struggle between christologies: the figure “Jesus of Nazareth” (Stage 3) against the docetic conception of Jesus as a divine spirit indwelling multiple hostile bodies of flesh (Stage 2). 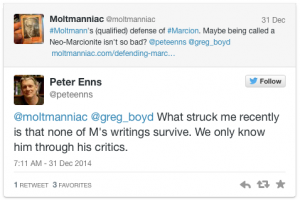 You say T never communicates that Marcion wrote anything with “arguable exception of the Antitheses”. Thanks. I’ve tried to leave open the question of whether the Antitheses was written, and who wrote it. If the citation you furnish (AM I.19) is an accurate translation, it indeed describes a written document—furthermore, one “by which [Marcionites] are inducted” (baptismal?). I find it a bit maddening trying to extract solid evidence from what T writes, given his wide latitude for dissembling and his extreme partisanship. IMO, everything he writes must be treated with caution. Agree, and further, his 5 volume treatise was apparently completed in 207CE, by which date he had already joined with the Montanists–so what benefit would Tertullian have derived, by arguing against Marcion? Why would he publish such a text? Was Tertullian really a believer in Trinitarianism, and also a believer in the superiority of the Paraclete, who Montanus claimed, spoke directly to adherents? Seems to me, that Tertullian must have rejected Trinitarianism, in favor of the ecstasy of Montanus. I am puzzled why Hippolytus of Rome, who wrote, in Greek, against both Marcion and Montanism, seems to have not mentioned Tertullian’s compositions on these same two subjects, though Hippolytus (Philosophumena) had written just a decade or two after Tertullian’s death. Did any author cite Tertullian, before Eusebius and his son, Jerome? How do we know, with any conviction, that the entire corpus of Tertullian is not fabricated, whole cloth, decades after his death? According to Stuart Waugh, almost all patristic writings have been manipulated or fabricated after the time of the Decian proscription in the middle of the third century. The Gospel of the Egyptians from Nag Hammadi contains also a spiritual Jesus.